Our Safety Leadership Programs are designed to bring the best performance out of your people. 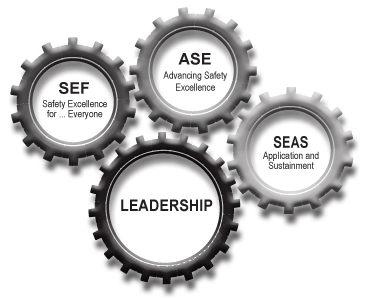 Twenty plus years, and hundreds of thousands of participants all over the world, has proven that our original SEFSAM, “Safety Excellence For Supervisors And Managers” program continues to be the benchmark Safety Leadership Program within the Construction, Manufacturing and Oil and Gas industries. The development of our next generation ASE, “Advancing Safety Excellence” program assured that Global was once again at the forefront of developing superior safety leadership knowledge, skill and the desire to lead workforces to incident and injury free operations. The much anticipated and highly successful launch of our SEAS, “Safety Excellence Application and Sustainment” programs, has ensured when a participant completes SEFSAM or ASE they have the tools and ability to measure their success in applying our programs. Our commitment to ensure that clients have the ability to align, apply and sustain the Safety Excellence program ensures that our clients maximize their valuable training dollars and ensures long term safe operations. Our inspiring and knowledge building programs continue to be attended by leaders in Australia, Africa, Asia, Europe and North America. The overwhelming feedback from our participants proves our Safety Excellence programs continue to inspire and empower the leaders of today…and tomorrow. We welcome the opportunity to discuss how our three feature programs can enhance your operations and provide the benefits that your company deserves in achieving elite safety performance.